The blog reader called 'dumondoj' left a comment on yesterday's post wondering if it was random that ABBA had received her beginning during Beginnings. Whether it was random or not, she definitely did get her new beginning during Beginnings. In fact I think Beginnings brought about many new beginnings on the whole. Soon after the ABBA story, my sister Kathryn sent out a heart-wrenching e-mail about her own dogs. She and her son Liu, my nephew, have cause to move and unfortunately had to give up their dogs ... since finding another house with a garden at a price anyone but a millionaire can afford is not easy. Amazingly, she was overwhelmed with responses. Everyone was forwarding the e-mail far and wide to their various networks. All kinds of people she didn't even know where calling to express interest in the dogs and/or to offer words of comfort and condolence. Someone even offered counseling to assist them as they made their shift in parting with the pets. Within about a week the dogs all had new homes with animal lovers! 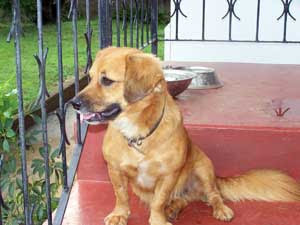 Mandy went to a young woman who is going to get another dog for her as a companion. This young woman even bought a special cover for Mandy to sit on in the car - "as opposed to just putting an old towel," as Kathryn pointed out. Spike, who wandered into Kathryn and Liu's garden one day and never left. 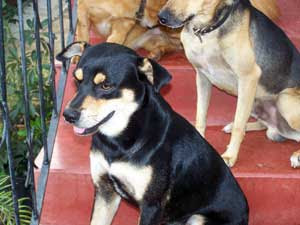 Fidel (otherwise known as Feedie): a strange mix of Rottweiler and a small pompek-ish breed. How that mating session was possible is anyone's guess. Spike and Fidel, the two males, will be moving together, to live with a family in South. These people are animal lovers and apparently recently adopted a stray dog. People who adopt stray dogs and love them go up in my books. They don't care whether the dog is 'a breed'. They love him/her for who s/he is. In a world ... or more specifically, on an island where it's tough to get homes for animals (especially cats), we've definitely been seeing some success stories as of late! 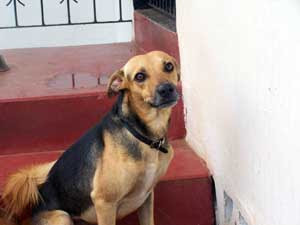 I get the impression that there are a LOT of dogs in Trinidad, and lots of strays. I'm so happy to hear of so many adoptions. Yes, definitely lots of strays. Too many.